Movie Menus abbina film classici con ricette facili aggiornate attraverso storici libri di cucina e ti aiuta a creare l'esperienza di un pasto speciale per ogni genere di film. "The recipes, designed for easy entertaining on Oscar night, are grouped according to movie categories like westerns, romance, and gangsters. There are more bits of movie trivia and quotations in the pages than there are peas in a potpie." "Packed with food and movie trivia, it's a good read during commercial breaks for Sunday night's Oscar epic." 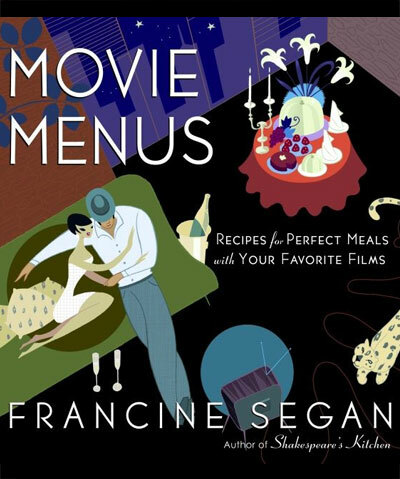 "Now, author Francine Segan has found a way to let all of us in on the act of pairing food with film not on the screen, however, but in front of it…She also serves up a hefty helping of movie trivia, movie quotes, movie-party ideas and lists of suggested films. "If you've been looking for the perfect medieval meal and movie for your next Middle Ages Feast, pour yourself a goblet of mead and check out Movie Menus….In 10 themed chapters, movie buff Francine Segan pairs recipes with movie quotes, food and film trivia, and unusual cooking tips-an original recipe from the 15th century, when clocks were rare, says to boil the eggplant for no longer than it takes to say the "Our Father" twice….This thoroughly researched ode to food and film puts pizza and a video to shame." "On Oscar night, the Middle Ages will sit down to dinner with the Great Depression-at least at Francine Segan's Manhattan dining table. Segan, whose just-published Movie Menus pairs films with recipes from the times and places in which they're set, parlayed a penchant for throwing theme parties into a second career. The psychologist turned food historian and cookbook author also wrote Shakespeare's Kitchen and Philosopher's Kitchen, to be published in the fall…."